Quilted jacket by MYBC: sporty and versatile! A wonderfully warm piece with a detachable hood made of soft, slightly iridescent microfibre in the new autumn colours. 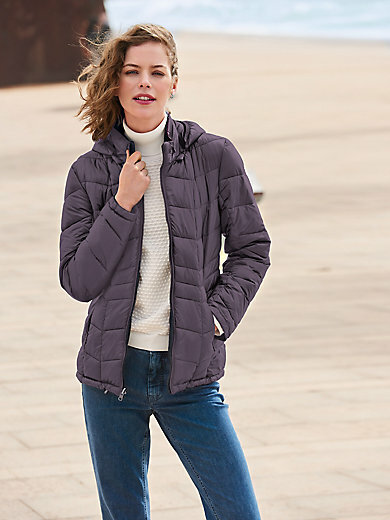 With high closing, padded standup collar, zip fastener and cleverly placed, flattering quilting and 2 practical and secure zipped seam pockets. Soft, down-like filling made of 100% polyester. Outer fabric made of 100% nylon. Lining in 100% polyester. Length approx. 27ins. The quilted jacket is machine washable.